Yesterday, I finished up the sweater that resulted from that pile of delicious Madelinetosh tosh DK I bought on impulse over the summer. It’s great, and it’s almost ready to get shown off, and I am excited to share it with you, and this Sequoia is such an autumnal red-orange colour that the timing really couldn’t be better. Like a lot of knitters, I have the tendency to stick to certain parts of the colour wheel when choosing my yarn colours. Reds, purples, greens, pinks are the shades you’ll see a lot of in my stash, and I love them a lot, but I’m trying to branch out. Yellows and oranges are the least common colours for me, so I’m approaching them a bit sideways by bringing in orange first, sneakily by way of red. Reddish orange, yes, I think we can be friends. I did up the button-bands, and finished it all up, and gave it a bath, and now it’s blocking while the notes are off with the tech editor, which is all fantastic. But I have to admit, I might be even more excited over the fact that I get to bring a new pile of red-orange wool onto the needles. This little stack of Cascade 220 Heathers has been waiting in the wings for almost a year, and I’ve known since about February exactly what I want to do with it. 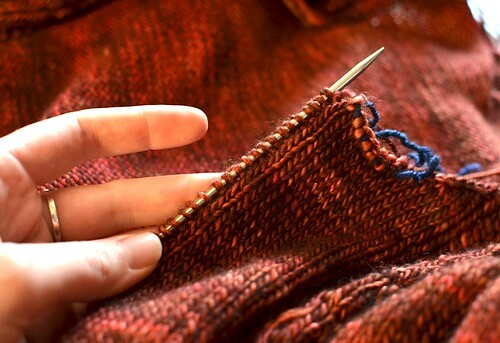 There’s just so many awesome yarns out there, and so little time. I’ve got other colours waiting in the wings who might not stand for this orange colour jag business for too much longer. Better get knitting. 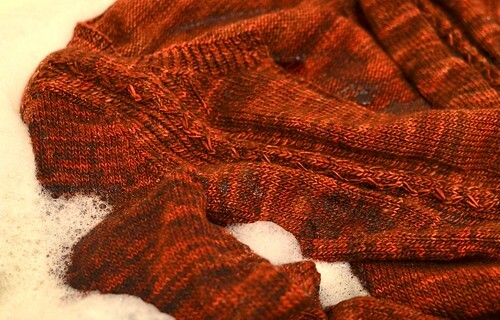 The sequoia cardigan is beautiful! I can’t wait until you release the pattern. Wow- it really is gorgeous! There is a lot of knitting in that garment!!! I’m very partial to yellows, oranges and white. The colour you’ve chosen is a good choice to be practical yet classy. take care. It looks great. I love the reddish orange too! Beautiful!!! I love earth tones and of course that one especially. My livingroom is painted a shade of that color. Will be watching for the finished project and waiting for your next one too! Color Jag why not! I’m into a shawl jag right now. 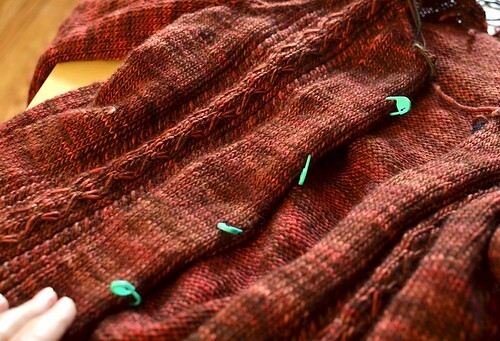 That is gorgeous — can’t wait to see it blocked and getting a beauty shot! I’d have to approach orange the same way, kind of through the reddish rusty side. As much as I love autumnal colors, they are not the best thing for me to wear. Rust, I can do. And honestly, my red sweater in the works is a bit of a departure for this “blue is my very bestest friend” girl. I have some Cascade 220 Heathers waiting for me when I get home in my mailbox. Can’t wait to touch it! ( Can’t remember the color right now) Beautiful colors! What is the best way to go about picking a new project? Pick yarn you like and find a pattern later? Or pick a pattern/object to knit and then find some yarn for it? 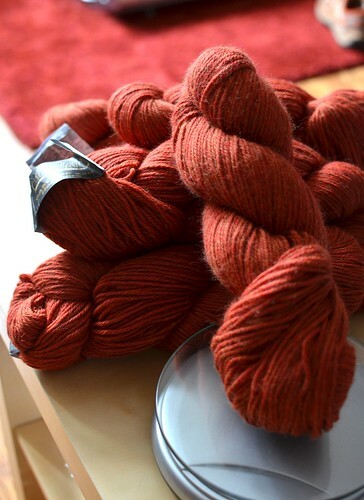 Re the autumnal reds, have you seen Cephalopod Yarns’ Skinny Bugga! “Strawberry Crab” colourway? Much like Tiziano Red, but a bit deeper and richer. Take a look!